Winter Game Day is coming! 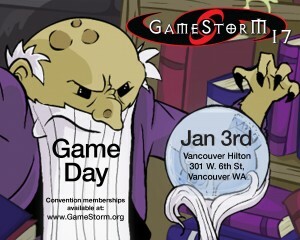 GameStorm invites you to join us for our Game Day on Jan 3rd at the Vancouver Hilton. Bring a friend and join us for a full day of tabletop play! The Game Library will be present with several hundred titles to choose from. Try something new or show off something you enjoy playing. Memberships for our March convention will be available for purchase at a $5 discount! The event runs 9am to 9pm and is open to the public free of charge. Follow GameStorm on Facebook and sign up for our mailing list to stay up to date with convention news, events, and other content.